During our summer road trip, my husband and I stopped for a night in Sacramento (between San Francisco and Yosemite). We had done a lot of sightseeing in San Francisco and we were a little tired, so we didn’t explore the city much. We did, however, find a nice Italian restaurant called Biba where we had a very tasty meal. The restaurant is owned by Biba Caggiano, an accomplished Italian cookbook author. We didn’t realize it was a fancy place till we went inside– Sacramento is the state capital, and the place was full of official looking people in suits (undoubtedly politicians). Luckily this is California, and the restaurant didn’t take exception to our road trip jeans. 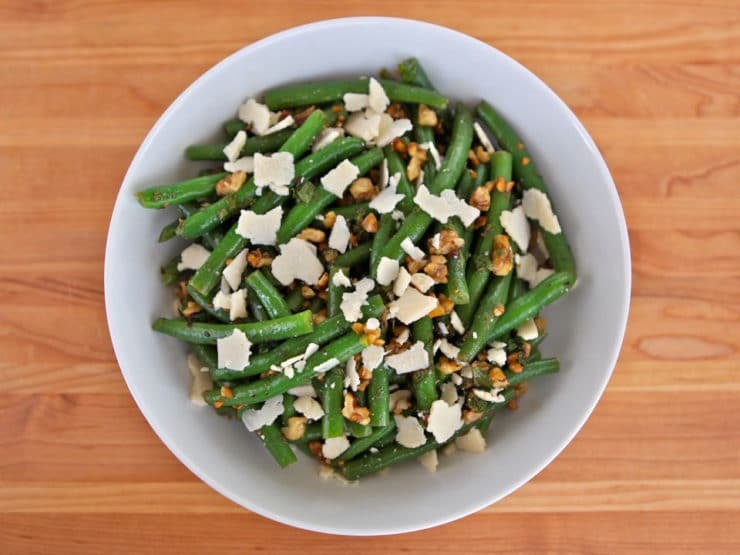 As a starter, we split a string bean salad with parmesan, pine nuts, and mint. I liked the unique combination of green beans, yellow beans, mint, and parmesan. Of course, I’m always looking to put my own twist on things, so I began wondering what it would be like with more crunch and a touch of sweetness. In my mind, I whipped up something similar, adding white balsamic for a sweet flavor and toasted walnuts for crunch. I made a mental note to try it at home. Yesterday I made the salad, and it was everything I imagined… cheesy, crunchy, toasty, and just slightly sweet. The shaved parmesan adds so much more flavor than the pre-grated stuff ever could. 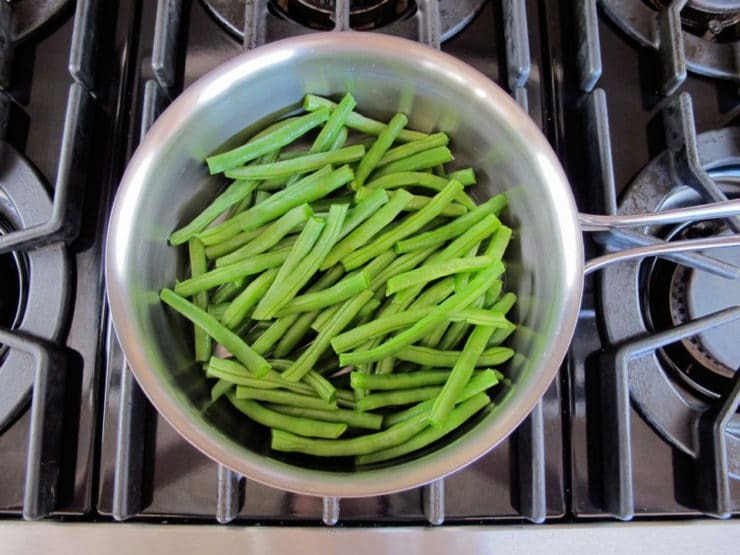 If you can find young green beans– the small, thin, more delicate ones– it will be even tastier. My local grocery store rarely carries them, but I can sometimes find them at the farmer’s market. 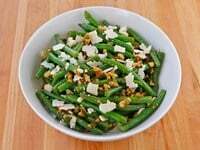 The salad would also work well with a combination of green and yellow string beans, as it was served at Biba. If you want to do some prep work in advance, you can steam and blanche the beans ahead of time and refrigerate till ready to serve. Dress the salad just before serving; the longer they sit in the dressing, the duller the beans will look. I like the salad best just slightly chilled, so leave the beans out of the fridge for a few minutes before dressing them to bring them closer to room temperature. And don’t forget to toast the walnuts. That simple extra step adds a world of flavor. One more thing… if you’re vegetarian, look for a parmesan-style cheese with a microbial rennet (Bel Gioioso makes one). Kosher cheeses are often produced with a microbial rennet, but not always. Check with a kosher authority for further information, or use another type of vegetarian cheese if you prefer. Any hard cheese with a nutty flavor would work well. Next time I make the salad, I will probably use Unie Kaas Robusto, one of my all time favorite cheeses (not vegetarian, but fabulous). Enjoy! 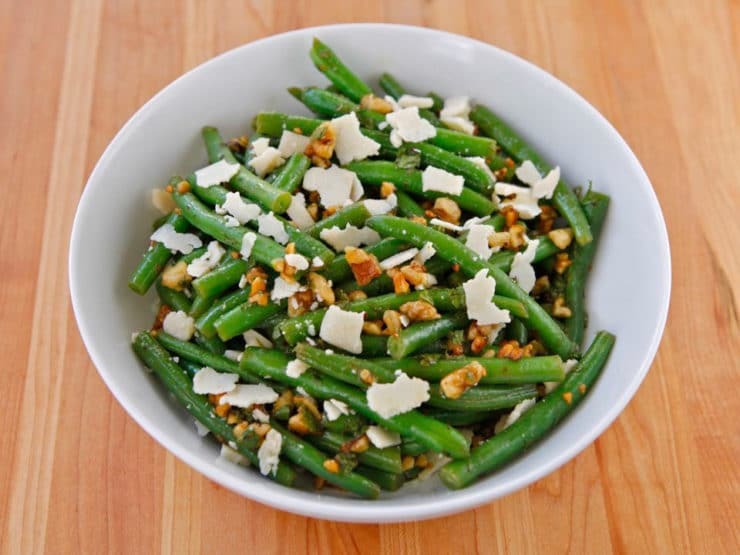 Flavorful salad with lightly steamed green beans, roasted chopped walnuts, fresh mint, shaved parmesan, olive oil and white balsamic vinegar. 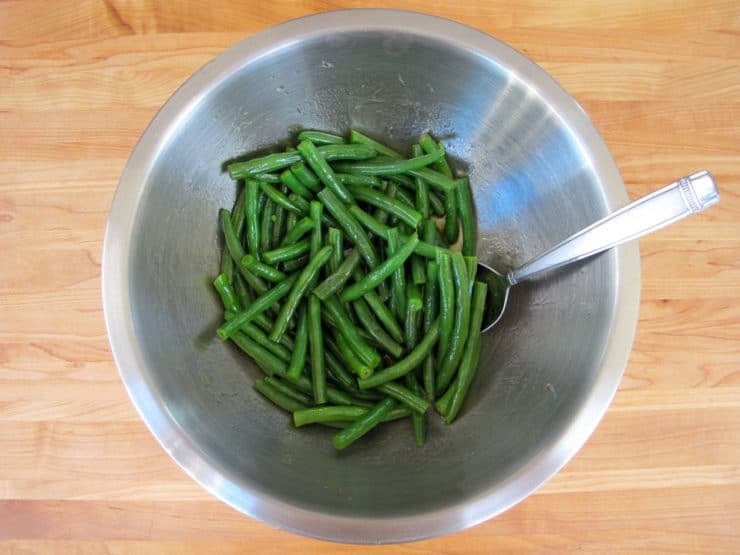 Cut the green beans into pieces about 4 inches long (if you're using small young beans, no need to cut them). Put the beans into a pan along with 1/2 cup of water. Bring the water to a boil and cover the pan. Turn the heat to medium and let the beans steam for about 5 minutes till tender-crisp. Smaller, younger beans will take less time to steam-- check them after 2-3 minutes. 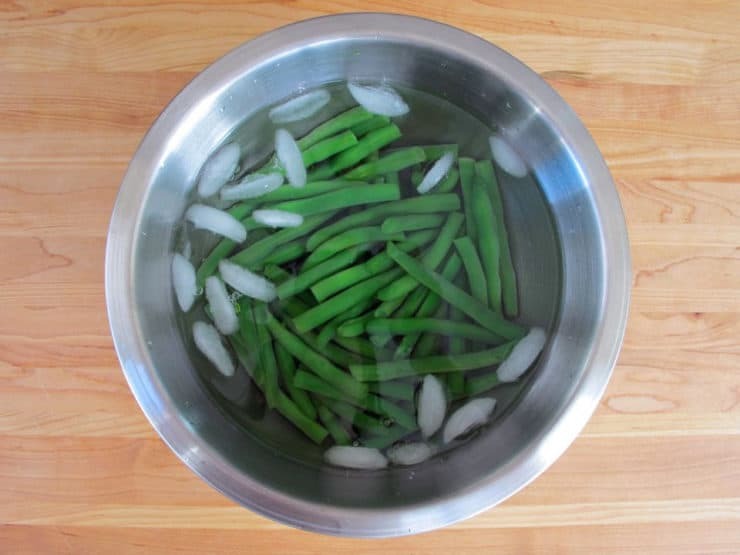 Drain the green beans and transfer them immediately to a bowl of ice water. Leave them there to cool. 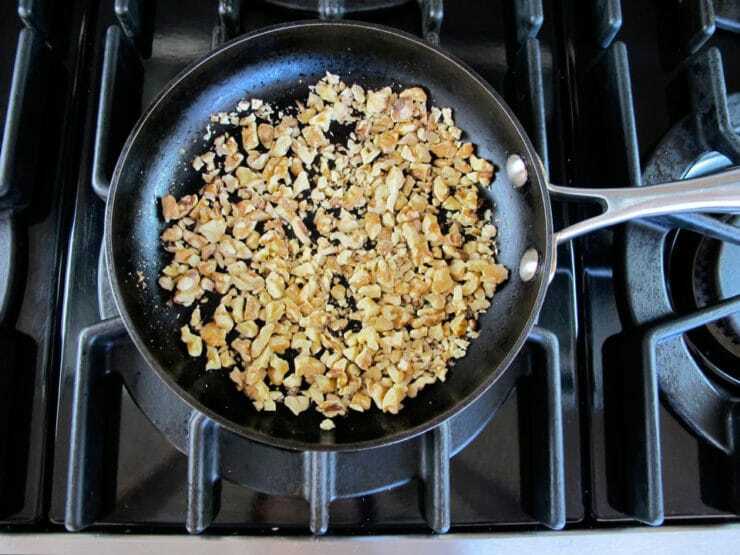 Put the chopped walnuts into a skillet over medium heat. Let the walnuts toast for a few minutes, stirring frequently, till the nuts are fragrant. Don't let them toast too long or the skin will burn and the walnuts will taste bitter. When they're nicely toasted, remove from heat and pour them immediately into a bowl. Drain the green beans and pat them dry with paper towels. Put them into a large bowl. In a small bowl, whisk together the olive oil, balsamic, and 1/4 tsp salt. Pour the dressing over the green beans and toss to coat. 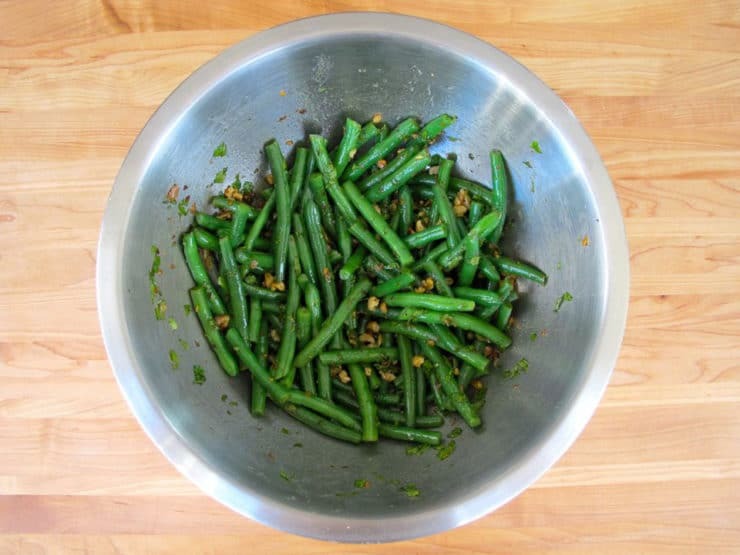 Add the chopped mint and walnuts to the green beans and toss to coat. Taste the salad. Season with salt and white pepper to taste, if desired. 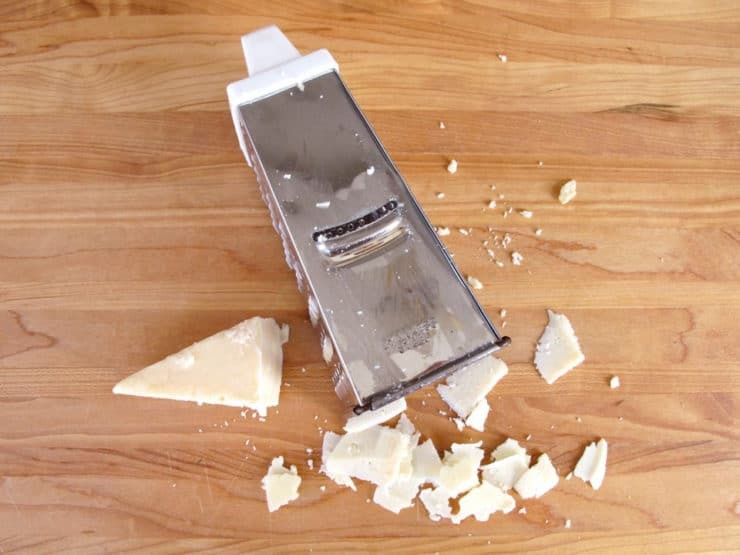 Shave the parmesan cheese with a grater. Break apart the shavings into small pieces. Sprinkle the shaved parmesan over the salad. Serve. I’d never toasted walnuts before in my life but I’m glad I followed the recipe because it was worth it! Wonderful combination of flavours, I’ll certainly be making this more often. However, I made it as a side dish instead of a starter, seeing as it was a spur of the moment decision to try this. 🙂 Do you have any recommendations for this novice cook as to what would go well with this salad? What is the difference between shaved and grated (referring to the instructions for the cheese prep)? Hi Alice! Shaved means you shave very thin slices from the cheese. Most cheese graters have a long, thin whole with one sharp edge that will allow you to shave small pieces off the cheese (you can see it in the picture above on my box grater). I like the shaved pieces in this salad because you get more “bite” to the cheese and a more pronounced flavor. If for some reason you don’t have a shaver on your grater, feel free to use the large shred holes to grate. Enjoy! Thank you… We have a huge crop of pole beans, and this sounds like a perfect way to use some!